The image above is a visible light image of the star VY Canis Majoris. 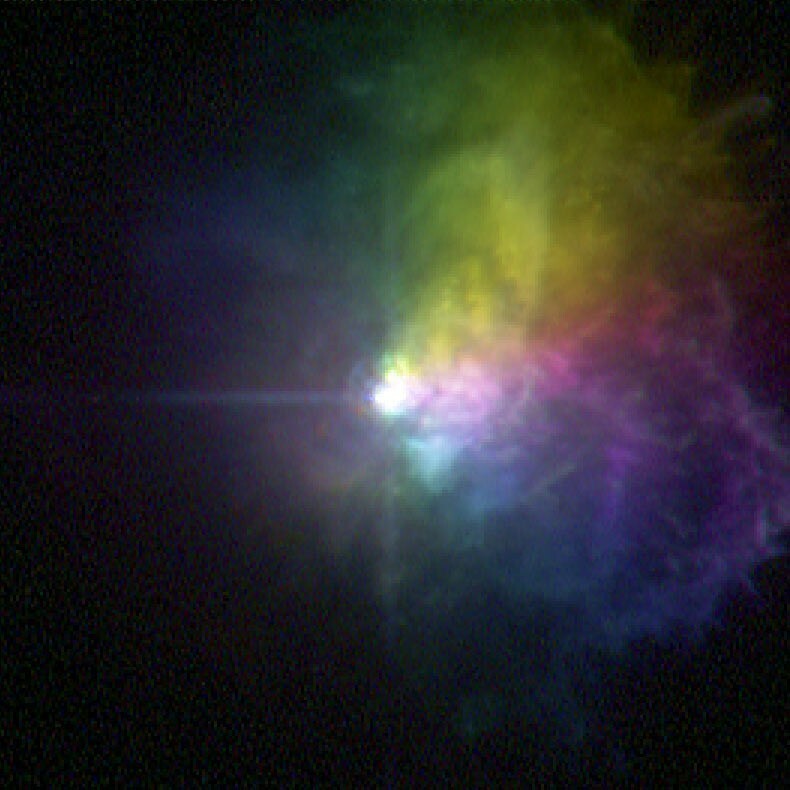 The rainbow effect you see is not due to false color imaging (though the image has been manipulated a bit to make the colors stand out), but due to the fact that it is a polarized light image of the star. When we think of the properties of light, we usually think of its brightness and color, but there is another property of light known as polarization. If you imagine light as a vibration in a string, then the size of the vibration (amplitude) is what determines its brightness, and the spacing between waves (wavelength) is what determines color. You might also notice that although the string vibrates up and down, the wave travels along the string. Since the vibration is perpendicular to the motion of the wave, the wave can have an orientation known as polarization. For example, if you shake a wave up and down you get one polarization, and if you shake it left and right you get a different polarization. Most of the time we don’t notice the polarization of light. One way polarization is used is with polarized sunglasses. If you’ve ever had a good pair, you’ll notice that they remove much of the glare without making things overly dark. The reason for this is that when light reflects off a surface at a shallow angle, the reflected light is polarized parallel to the surface. Since most reflective surfaces are generally horizontal, most glare is polarized horizontally. Polarized sunglass lenses are polarized filters that block horizontally polarized light, but let other orientations pass through, thus most of the glare is removed. When starlight reflects off of dust particles, it can be polarized in a similar way, so by looking at the orientation of scattered starlight we can learn about the distribution of dust around a star. This is what the image below demonstrates. It was made by taking images of VY Canis Majoris through different polarizing filters. Each filter also selected for color, so red had one orientation, green another, and blue still another. The resulting image below gives us information about how different regions of the star’s ejected dust are oriented. From this and other measurements we know that VY Canis Majoris has ejected different regions of the surrounding dust at different times in its history. Polarization. One more way to gather information about starlight.